You are what the soil eats – Take care of Mother Earth and she will take care of YOU! Would you like to be part of a growing movement that is actively restoring the world’s soils, while growing super-nutritious foods and simultaneously chelating enough Carbon to potentially stop Climate Change? Would you like to be part of a growing movement that is actively restoring the world’s soils, while growing super-nutritious foods and simultaneously chelating enough Carbon to potentially stop Climate Change? Many of us work with soils, plants and compost but very few have a deep understanding of how soil health and fertility is built at a biological level. Why are weeds, pests, and plant diseases such an issue in the first place? Why do some plants thrive while others are so fragile? The answer is in the microbiology of the soil. Humates are highly compressed, natural organic humus; the decayed remains of tropical rain forests which existed millions of years ago. Humate deposits were once buried deeply but have been exhumed to near-surface conditions and oxidized by bacterial action in exactly the same way as humus is formed in rich agricultural soils. Thus humates provide a concentrated source of naturally occurring humus to the soil. Humates have a high humic acid content (humic acid is one of the most biochemically active elements in humus). The minerals and trace elements contained in humates are readily available to plants through organic complexing. Adding humates is the most efficient way to increase the humus content of soil, as it is highly concentrated and much easier to apply than any other form of humic matter. Also, since humates are completely decomposed, there is no nutritional competition with plants for nutrients such as nitrogen. The most well-known and prominent benefit of Humic and Fulvic acids are how they increase nutrient uptake in the plants. Humates have been shown to consistently improve the uptake of nutrients such as nitrogen, phosphorus and iron, as well as innumerable trace elements essential for plant health. This is due to the biochemically active nature of humic acid and is ability to form both soluble and insoluble complexes with various metals, minerals and organic matter. Nutrients are converted to forms that the plants can utilize. A consistent result from all crops tested was increased root growth. Length, density and radius of plant roots dramatically increased. Tests have shown that root system vigor is very important to a plant’s ability to uptake nutrients, as well as to its ability to combat disease. In addition, plant stability is enhanced and plants are better able to find and absorb water with a broad-based root system. Humic matter has been shown to increase the chlorophyll content in plants and can prevent or correct chlorosis. Humates can improve the quality, appearance and nutritional content of fruits and vegetables. Cereal crops have shown a higher protein content and a more balanced amino acid content, all of which can increase their value in the marketplace. The biochemically active nature of humic acid works to enhance a plant’s natural defenses against toxins and disease. Many toxins are inhibited or neutralized directly by bonding interactions with humic acids. In addition, biologically active compounds (such as antibiotics and phenolic acids) found in healthy humus can enhance plant resistance to some diseases. Finally, plants which are healthy and receive all of their required nutrients are better able to combat disease and pests. Humus combines with clay minerals to form structural units called aggregates. These help to stabilize the soil and increase its permeability to water and gaseous exchanges. Also, beneficial bacteria and earthworms, which make a large contribution to the maintenance of soil structure are dependent upon humus content. The use of humate can also prevent soil cracking, which exposes roots to the air and can cause crops to burn in severe heat conditions. Since organic matter is not water soluble, soil with a high humus content is less likely to be subject to water erosion. Humates can hold up to 20 times their weight in water. By enhancing the soil’s ability to retain water, humate usage can reduce the amount of water needed for crop irrigation. This can be especially helpful with sandy soils and contributes a large measure of drought resistance to crops. Because of the chemical bonding interactions of humic acid, plants are able to grow in soil with more widely varying pH values. In addition, the humic stimulation of microbial activity leads to a healthy soil biota which will ultimately bring the pH of the soil into a more normal range. Humates have been shown to provide a significant increase in crop yields when combined with other current fertilizer programs. Humates can improve root development, total leaf area and total crop yields per acre. ShopFreeMart Organic Mineralizer is ideal for use on all soils and plants under all conditions. Humic and fulvic acids found in ShopFreeMart Mineralizer act as natural chelating agents, binding to nutrients in the soil. The plants roots absorb these humic and fulvic acid nutrient compounds effectively increasing the efficiency of the plant’s uptake of nutrients and decreasing nutrient losses caused by leaching. Being a concentrated and soluble powder, when mixed with water, it is highly effective at delivering humic acids deep into the soil and/or to the plant. In combination with fertilization, it allows you to get the most out of your fertilization program and may even reduce the amount of fertilizer needed. Mineralizer contributes to improving soil quality, texture, water holding capacity and sustainability, all while breaking down clay lattices and reducing sodium buildup in the soil. When using ShopFreeMart Organic Mineralizer you can make small or large batches as often as needed. This way there is no need to over-winter excess liquid, reducing storage and handling. Can be used for the treating of seeds, growing of seedlings and foliar spraying of plants throughout their life cycle. 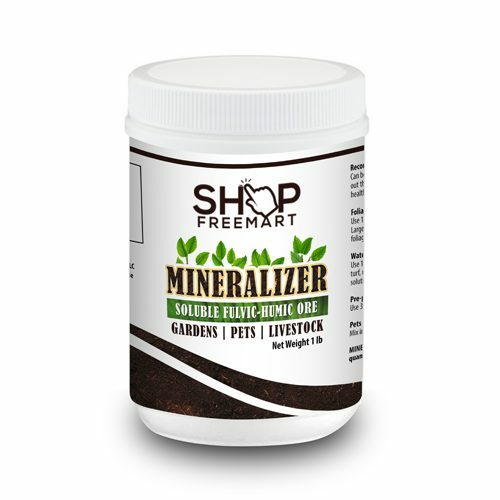 Adding ShopFreeMart Organic Mineralizer to water and or feed for pets and livestock can improve health and decrease mortality rates. DO NOT exceed recommendations. Use 1 tsp. per 4 gallons of water every 14-21 days throughout the growing season. Larger quantities: Mix 1 oz. in 50 gallons of water to cover one acre. Spray early morning or evening. Wet foliage, but not to the point of runoff. Use 1 tsp. per 4 gallons of water every 14-21 days throughout growing season. For landscape and turf, use 5-6 quarts per plant 4-6 times per season. Water seedlings when transplanting with same solution. 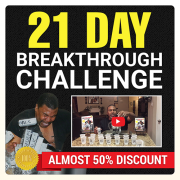 Mix 1 gram of Mineralizer into food for every 150 lbs. of body weight. MINERALIZER does not replace the use of some fertilizers, but will reduce the quantity needed.